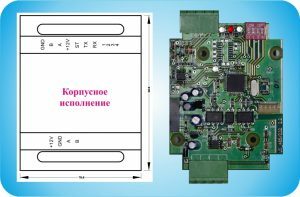 Universal Communication Module (UCM) Designed to receive data from primary sources of information, their processing, storage and transmission, as well as to control executing devices. Switching unit (SU-02) Designed to intercept an external amplifier signal and to control the apparatus P-164. Universal Modem Device (UMD-01) Designed to transmit data and voice announcements via wired (dedicated and switched) and mobile (GSM standard) communication channels. Made in a plastic case. Includes 4 wired and 2 GSM channels. Universal Modem Device (UMD-02) Designed to transmit data and voice announcements via wired (dedicated and switched) and mobile (GSM standard) communication channels. Made in a metal case. Includes 8 wired and 4 GSM channels. 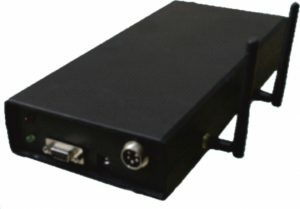 Universal Modem Device (UMD-03) Designed to transmit data and voice announcements via wired (dedicated and switched) and mobile (GSM standard) communication channels. Made in a metal case. Includes 12 wired and 6 GSM channels. 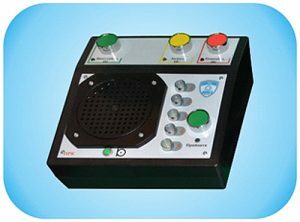 Manual control console (MCC) Designed to operate alerts on potentially dangerous facilities, for which the only possible scenario of emergencies has been defined. Made as part of Early Detection of Emergencies and Alert Automated Systems. Matching device (UCM-DS) Designed to match UCM with gas analyzers «DOZOR-S» and «DOZOR-S-C» produced by SPE «ORION». 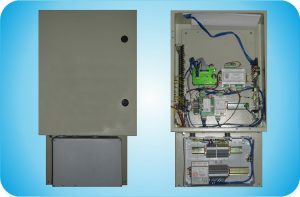 Matching device (UCM-WS) Designed to match UCM with automatic weather station WS-2300 and WS-2350 produced by La Crosse company. Matching device (UCM-Struna) Designed to match UCM with «Struna» measuring system. Matching device (UCM-ЛР) Designed to match UCM with input signals of such types as «dry contact», «logic level» and «open collector». 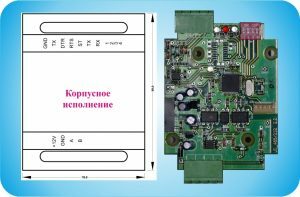 Matching device (UCM-СП) Designed to match UCM with «current loop» type input signals. 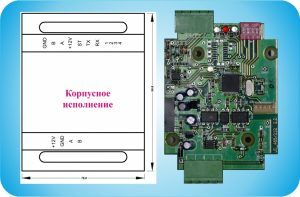 Matching device (UCM-МТМ900) Designed to match UCM with ultrasonic level sensors МТМ-900 produced by SPE «Mikroterm». Matching device (UCM-VR) Designed to match UCM with gauging system TLS produced by Veeder Root. 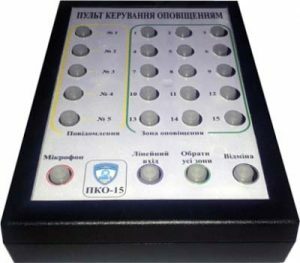 Matching device (UCM-OP) Designed to match UCM with gas analyzers SHCHEET-3 produced by CJSC «Khimavtomatika». Matching device (UCM-MPS) Designed for matching UCM with pressure sensors MPS-8 «Atlas». 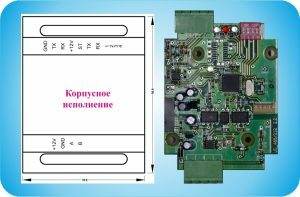 Matching device (UCM-HTS) Designed for matching UCM with humidity and temperature sensor HTS, produced by SPC «REGMIK». 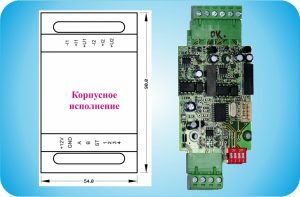 Matching device (UCM-МТМ701) Designed for matching UCM with pressure transmitter МТМ-701 produced by SPE «Mikroterm». 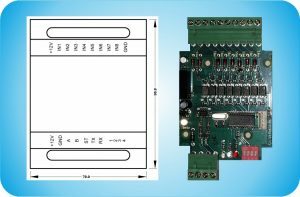 Matching device (UCM-DM) Designed for matching UCM with measuring probes DIGIMAG SMT/XMT produced by «Start Italiana». 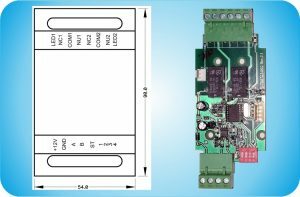 Alerting Control Module (ACM) Designed to alert by means of public communication networks (wired and mobile), local networks, FM broadcast networks. Broadcast network control device based on МКО-4Т-R Designed to intercept wired broadcasting, air and cable TV/Radio stations. Low frequency amplifier (LFA-150) Designed to work complete with ACM. 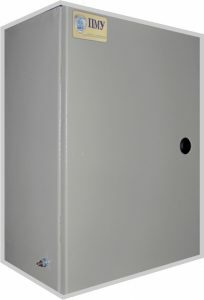 Power 150 W.
Alerting Control Console (ACC-15) Designed to alert by local areas, arrange searching communication. Works with ACM.